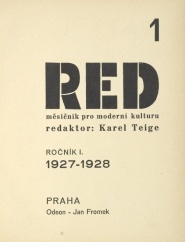 ReD (měsíčník pro moderní kulturu / Revue internationale illustrée de l’activité contemporaine / Internationale Monatsschrift für moderne Gestaltung) was an art magazine published by members of the Czech avant-garde art collective Devětsil, edited and designed by Karel Teige. Thirty numbers were published, with the special issues on the Russian avant-garde, Bauhaus, and photography/film/typography. Several manifestos appeared in the journal: Toyen and Jindřich Štyrský’s "Artificielisme" (1:1, 1927), Karel Teige’s second Poetism manifesto [Manifest Poetismu] (1:9, 1928), and Levá fronta [Left Front]‘s founding manifesto (3:2, 1929). ReD I, 1927-28, 10 issues, 360 pages. Download. 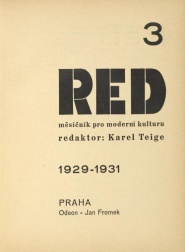 ReD II, 1928-29, 10 issues, 324 pages. Download. 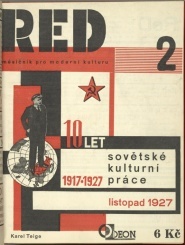 ReD III, 1929-31, 10 issues, 315 pages. Download. ReD 1:2 (November 1927): The Russian issue. Download. 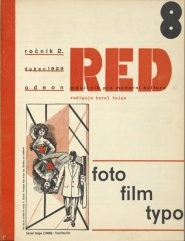 ReD 2:8 (April 1929): "Foto Film Typo". Download. 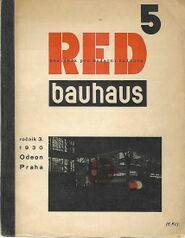 ReD 3:5 (February 1930): The Bauhaus issue. Download. The above PDFs are sourced from NYPL Digital Library (as of 1/2016 not available anymore). This page was last modified on 18 October 2016, at 20:18.